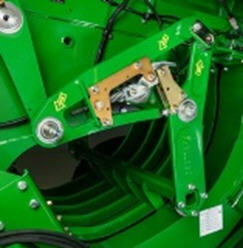 John Deere large square balers (LSBs) use a pickup drum with a roller baffle to efficiently pick crop up from the field. The performance of the roller baffle compressing the crop against the pickup tines means more crop in the bale, and fewer leaves and crop left in the field. Standard fixed gauge wheels provide smooth ground gauging over uneven terrain and protection to the pickup. 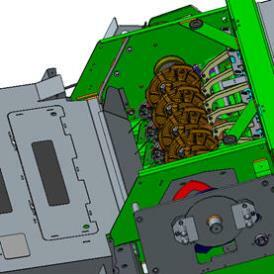 Optional pivoting gauge wheels reduce sliding and scuffing of the tires in the field when the baler turns. 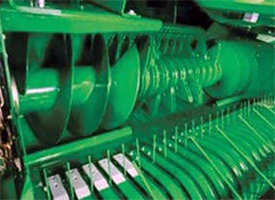 Both precutter and non precutter John Deere large square balers employ a heavy-duty feed rotor that utilizes a high-capacity in-line design. The high-capacity design has fewer moving parts to maintain. 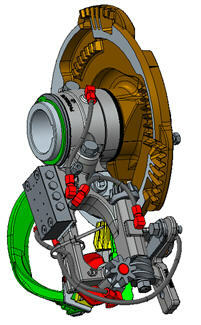 Incorporating the converging augers into the rotor design as one piece reduces the number of drive sprockets, chains, and bearings needed to drive the system. The V-shape of the rotor teeth evenly feed the crop into the pre-compression chamber resulting in well-shaped bales that stack easily. The high-capacity rotor is chain driven with a high-torque cutout clutch for protection. 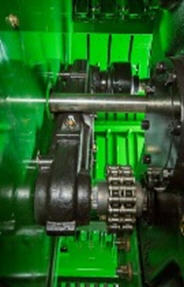 The cutout clutch is designed to feed most plugs at lower baler rpm to reduce the time spent unplugging the system. L330 Precutter offers a 10-knife precutter with a 70-mm (2.75-in.) theoretical length of cut. Precutter knives are spring loaded to offer protection from damage due to foreign objects. Knife engagement is activated from the tractor and monitor system. L340 Precutter offers a 23-knife precutter with a 45-mm (1.7-in.) theoretical length of cut. 23-knife precutter has a knife selector which allows the operator to select 23, 12, 11, or zero knives to be engaged at a time. 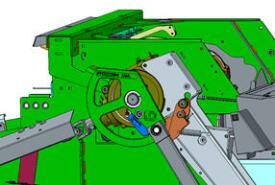 The knife selection can be made with a hydraulic valve on the left-hand side of the baler. 23-knife precutter utilizes hydraulic protection for each individual knife to prevent damage from foreign objects. John Deere large square balers are ISO compatible machines that are compatible with any ISO monitoring system. Current GreenStar™ (GS) displays, including the touchscreen 2630, 1800 as well as the GS 2600, are compatible for customers who already own a display. Baler control can also be incorporated into the CommandCenter™ on R Series Tractors as long as the tractor is ordered ISO ready (GS-ready wiring harness option code 8064 or GS AutoTrac™-ready wiring harness option code 8067on 6R Tractors). 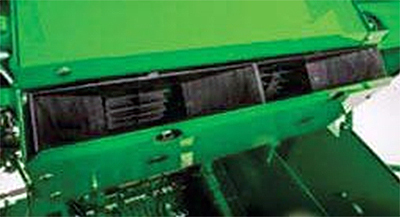 Balers that will be utilized on non-ISO tractors will require a GS display as well as a conversion harness to connect the display and the baler. L-Series Large Square Balers (LSBs) offer a manual bale density mode, allowing the operator to continue baling in the event of an electronics failure. 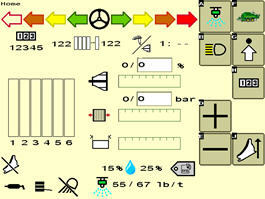 Driving direction arrows are shown across the top of the screen, helping the operator create a more uniform bale. 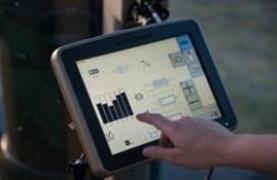 Harvest Tec automatic applicator is integrated into the baler display, allowing the operator the ability to monitor and make changes from one display. 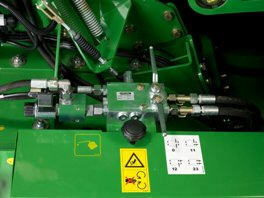 Electronic knotter flags are standard on all John Deere balers. 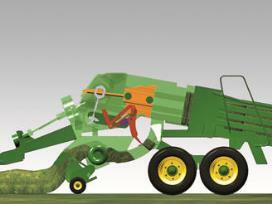 This feature offers convenience to operators by allowing for true look-ahead baling. L330 and L340 Large Square Balers (LSBs) come standard with double-tie knotters. 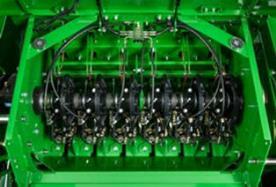 John Deere-designed knotters are designed for performance, reliability, and reduced maintenance requirements. The auto-lube system is integrated into the knotter frames, and two internal grease ports reduce the time spent on prebaling maintenance. 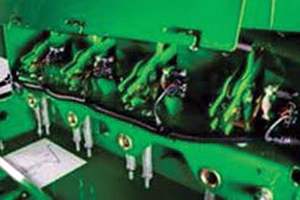 Intregration of the lube system block into the knotter frame reduces the number of grease lines required for each knotter. Integrated grease block results in a reduction in the amount of grease lines required to grease the knotter system and the number of grease line connection points. Fewer feet of grease lines and fewer connection points mean less maintenance and more time baling. In this series, the twine is stored in single-row twine boxes. The twine is then routed to the sealed gear tensioners. The sealed tensioner gears have been proven to provide more consistent twine tension during knot formation. This increases knotter performance and consistency. 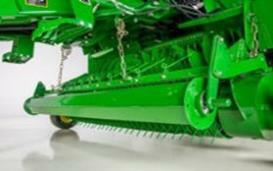 Once the correct bale length is achieved the tie system clutch is activated. The John Deere-designed double-tie knotting system is gear and driveline driven to ensure the needle-to-plunger timing is maintained throughout the life of the baler. The needle lift crank and clutch rocker arm are made of hardened cast iron to improve strength and durability of the knotter clutch. 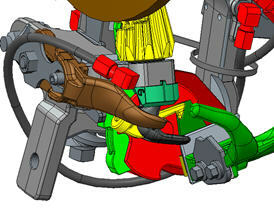 The gearbox drives the system around 360 degrees to complete a tie. The airflow ramp allows for crop and debris to cleanly exit the knotter table. 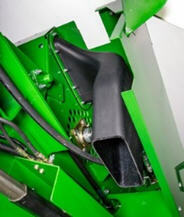 This increases knotter performance and decreases the amount of time required to blow off the baler. The air ramp mates with the walk platform, which allows the crop to continue off of the baler. The walk platform also has a trap door, which allows access for clean out and for mounting accessories. The split knotter frame is directly mounted to the intermittent gear, so the frame can be dismounted without servicing the knotter stack. If service to the knotter stack is required, the knotters are positioned using an adjustment screw instead of shims. This saves time by having the ability to make adjustments at any point of assembly. Like the John Deere single-tie knotter, the billhook cam and wiper arm plate are removable and individually serviceable. This allows replacement without replacing large castings or assemblies. Where competitors must adjust the wiper arm to the billhook with a hammer, the John Deere solution allows the setting to be made with two bolts. This allows a more precise and repeatable setting, which results in more consistent knot wipe offs. 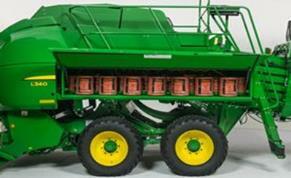 John Deere large square balers single-row twine boxes are designed to make loading of twine easy to accomplish. Twine box height makes it easy for any customer to load twine without having to place twine balls over shoulder height. Storage capacity of 30 balls of twine provide hours of baling without the need to refill. 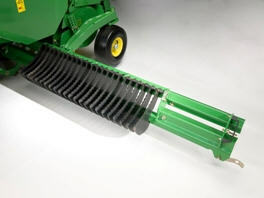 • John Deere knotter fans are designed for optimal airflow to keep the knotter table clean. Side ducts from the fan housing provide airflow down the side of the machine to keep the twine path from the twine boxes to the knotters clean. 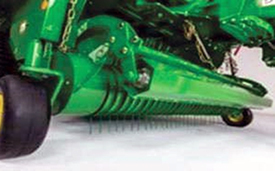 John Deere large square balers utilize a system in which a single feeder fork takes the crop from the back side of the rotor and packs the crop in the pre-compression chamber. Once the target density is met in the pre-compression chamber, the stuffer system then completes a longer stroke, which places the flake into the bale chamber to be compressed. The stuffer system runs at 90 strokes per minute, which is twice the speed of the plunger. This ensures that every flake experiences a minimum of one compression sweep in the pre-compression chamber before the crop is delivered to the main bale chamber, ensuring excellent bale density and bale shape. Stuffer system is gear and shaft driven for high reliability and consistent timing to the plunger. Clutch protection is standard on the stuffer-drive system. 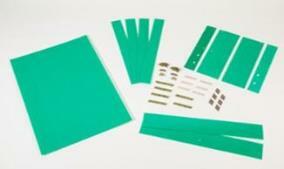 Optional silage kit is available consisting of low-friction plates that are installed in the floor of the chamber. 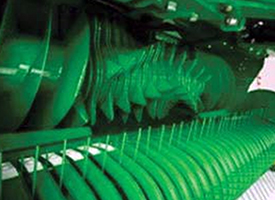 This kit helps hard-to-move silage crops slide in the chamber more easily. 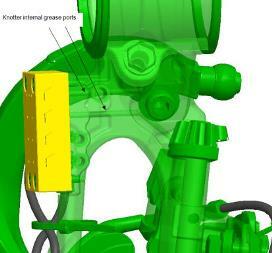 A mechanical lockout lever is available for the stuffer system for baling high-volume crops.